TG 325 OX® is a proven, premium quality, technical-grade magnesium oxide, manufactured through a proprietary process for application in municipal water and wastewater treatment. TG 325 OX® is mined and processed exclusively by Premier Magnesia, LLC in the USA. Your existing storage and feed system can be used to deliver TG 325 OX® without costly modifications. You can begin reaping the benefits of TG 325 OX® without up-front costs. surface area to provide the highest reactivity, and superior handling. and better dispersion, which is critical to treatment plant operations, while reducing sludge generation. TG 325 OX® has the highest available surface area and reactivity as a result of Premier’s proprietary manufacturing process. Wastewater treatment is performed in a sensitive biological environment wherein operation is performed at near-neutral or slightly alkaline conditions, requiring the highest reactive grade magnesium oxide available. 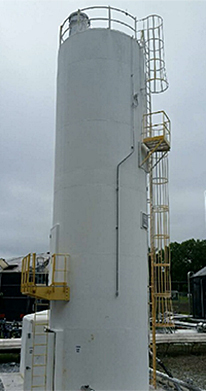 Less reactive grades are incapable of sufficiently neutralizing acid generated in these environments, and will pass through the system unused or accumulate as sludge.TG 325 OX® results in improved plant performance and reduced operating costs. TG 325 OX® is available at distribution terminals throughout the USA, and delivers Total System Treatment with multiple additional benefits. When compared to Quicklime, there is no “slaking” required. TG 325 OX® is the practical choice that provides a safer, more cost-effective alternative. Lime produces calcium carbonate in wastewater which acts as a coagulant for hardness and particulate matter. Lime may potentially increase the volume of waste sludge up to 50 percent. 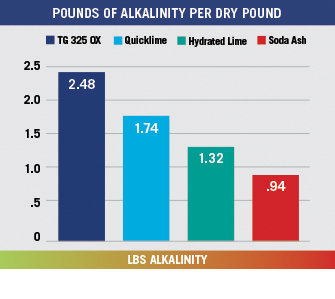 TG 325 OX®, hydrated lime, quicklime, and soda ash each have different physical and chemical properties that affect how each reacts with the systems to which they are added.